Debunked: 9/11 impact footage was faked, shows 'layering' error. Discussion in '9/11' started by Pete Tar, Sep 15, 2013. The following is a rare super slow motion video allegedly shot by an alleged “diamond merchant based out of Los Angeles, California”, according to the narrator. 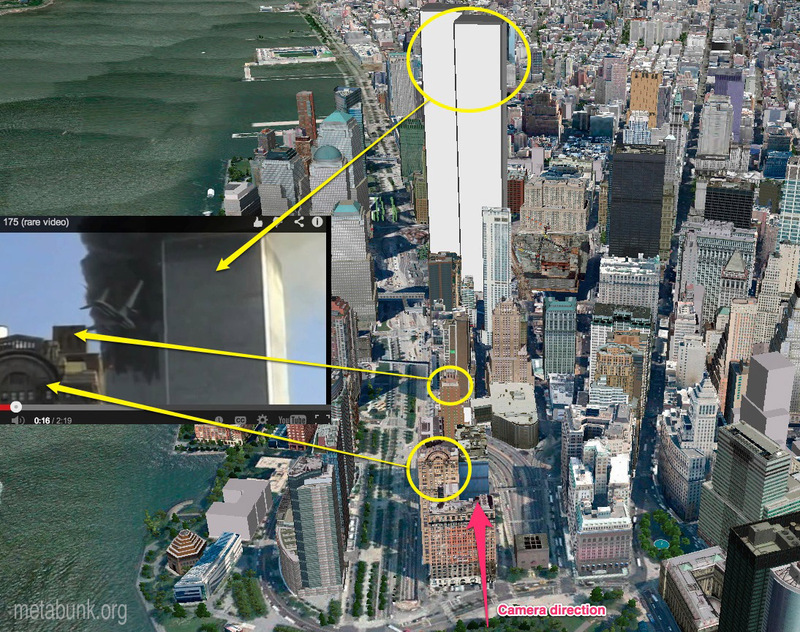 A still frame analysis of the video shows a building that’s “clearly behind the World Trade Center Tower”. The funny thing is, you can see how it actually shows on the building as being in front of the windowless grey plane, which is impossible. Just a case of being fooled by perspective I'm sure. Not exactly compelling. Looks more like that's part of the building in the foreground than behind the towers. 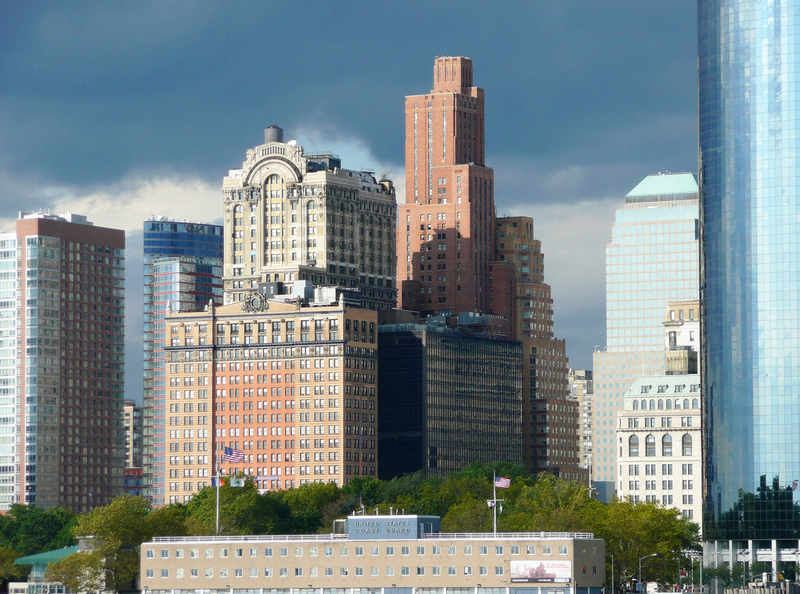 What building is in the foreground, and what building are they claiming it should be in front of but isn't? Looks like the building is in front of the WTC to me. Don't know why he says it's "clearly behind the WTC south tower" when there is nothing to show perspective. The building in question would have to be nearly as tall as the WTC if it was behind. Also he says it's a rare video, then he's explaining that the video was "seen all over the world, over and over and over again, year after year". Yeah I suppose I shouldn't be so lazy and actually work out the angle's and buildings, but basically the building is in front of the tower. And here's a picture showing just how close to the Whitehall building it is. In both pics you can see the 3 rows of windows that are visible in the video on the building the plane passes behind. And a shot to show the location in relation to the WTC towers. It's pretty clear to me that the building "behind" the towers, is in fact in front of it. Thanks, I got lost trying to orientate myself on google street maps. Yea, it took me a bit to identify the building in Google Earth, but once I did, it was super easy. Almost every pic has both buildings in it. Just one of the long shots with a telephoto lens and the perspective is flattened. Wow, it's a lot further away than I thought. The plane does seem to clip with the edge of the WTC, but that's just a compression artifact, like Anderson Cooper's disappearing nose. I believe the reason why the overlapping of details looks "strange" to most people is because the video frames has been interpolated using software to achieve slow motion. The original video material was likely interlaced NTSC video, which meant this slow motion effect was probably applied on already de-interlaced material, something that in itself usually cause minor visual artefacts on fast moving objects. This adds to the "strangeness" of the visual overlap. Why don't you say which buildings you think are missing? It's your theory, so you should be the one supplying the evidence for it. 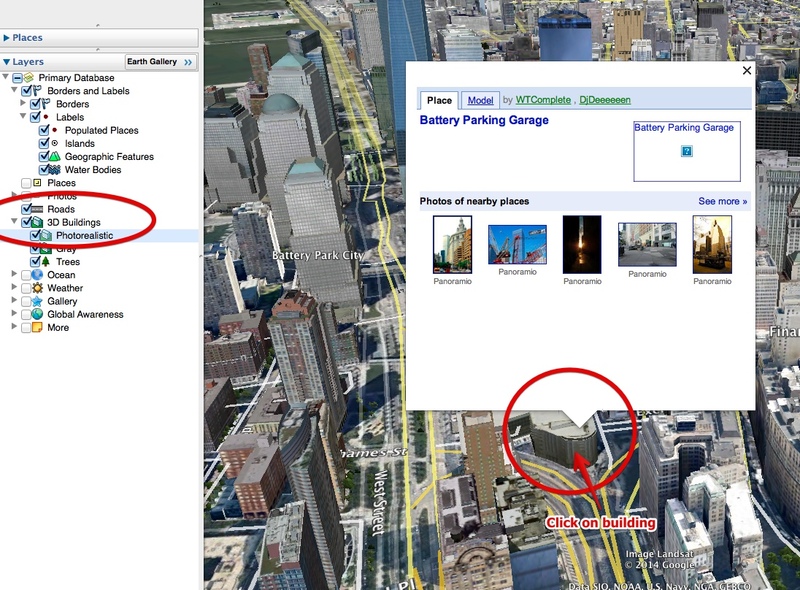 I suggest you install Google Earth, turn on 3D buildings, and then move the camera until the view is the same. Then take a screenshot. I gotcha that's exactly what I'm going to do. The shot is from ground level and I guess the camera man was zoomed all the way in? Is that accurate? Thanks for your help. I follow up in a few days. The shot might have been from in a building. I'm not sure. I really can't see why there would be other building anywhere near in that shot though. The important thing is the camera position, not the zoom. ok the really tall ugly silver building in front of towers was built 2010. that's what I was trying to find out.. thanks again. Would telephoto lense distort the view a little? 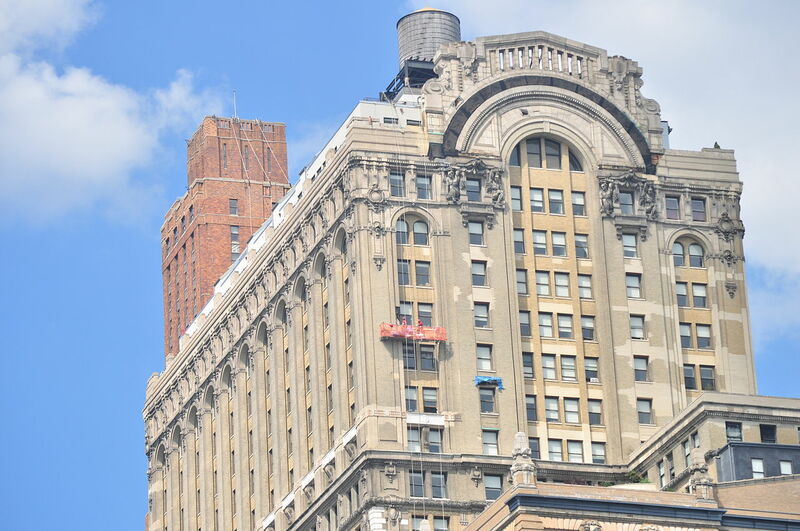 I think the angle of the shot would have passed over that tall silver building anyway (because it was far away). 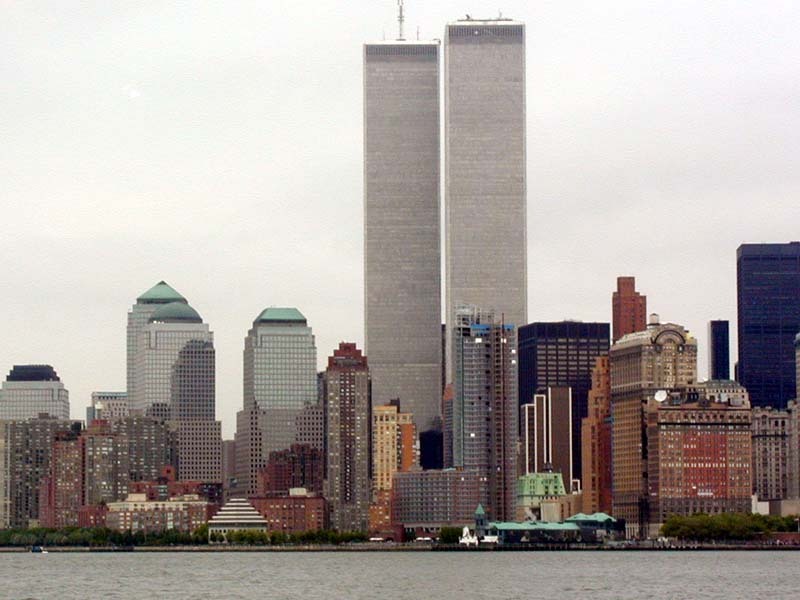 But the tall silver building wasn't there on 9/11 so its a moot point. Not really, a cropped segment of a 50mm shots is essentially the same as a 500mm shot if taken from the same position. The other problem I have with this is simple logic. If I was asked to composite or superimpose an aeroplane onto a landscape that is what I would do. i would have two layers. The Landscape layer and the aeroplane layer. Unless there was a need to, there is no way I would cut off any part or the landscape layer and paste it as a separate layer. But all of this applies to the video. If someone is faking footage of flight 175 onto footage of the building, why the hell would they cut a part of the new York Skyline footage and make a separate layer that would then even enable this "compositing mistake"? This (these) "questions" tend to replicate a narrative that has been on-going for over a decade. Usually attributed to a load of misinformation that is (firstly) gleaned off of the Internet. A compilation of historical videos that were taken, and hence archived. THEN, others come along and attempt to "micro-manage" every sniggling detail, and wrap themselves up into a "conspiracy" mindset, usually because of very, very simple misinterpretations OF the original video evidence. So don't investigate anomalies? I don't see your point. I'm an investigator, I investigate anomalies. You must agree that their are anomalies here correct? I can't answer for WW but to my mind, no, not really. the perspective is throwing you is all. battery park (where the video is from) is pretty far away from the towers, which is why the two buildings looks so "high" in the video and the plane goes behind the building. I would show you the camera angle but I cant figure out how to get my camera in street view to angle up. Find a tall tree and have a friend stand ( I don't know distances) like 100 feet way? or further. get down on your knees in front of your friend and look up at the tree and your friend. You'll see the same perspective as in that video. Your friends head will be very close to the top of the tree. Seriously....an "anomaly" is really in the "Eye Of the Observer". Think about it. THINK (please) about "optical illusions" (for example....please Google and find a vast resource). Also (to keep it short...TOO LATE!!!) think about the VAST amount of nonsense out there that claim the Apollo Moon landings were somehow "faked"......ALL of it based on very basic misunderstanding of the science of photography. Here: in this photo I am like 6-8 feet away from her. When I was standing up the red flowers came up to mid calf on her, so I laid down on the pavement and angled my camera up. edit: oh and the flowers are about a foot from me. so if a bumble bee was flying around her nose level a foot from HER, in my shot the bumble bee would look like it was behind the flowers. But if I stood up the bumble bee would look well above the flowers. There were no anomalies on 911, only our own lack of knowledge. There is what happened, no anomalies. Perspective might look like an anomaly, it is perspective. Did anyone notice the right wing as the tip passes behind the tower then reappears just before impact?? Yes, that's a combination of video compression on the original, and then the slow-motion software is adding extra frames, and "guessing" what those extra frames are. Is this a helpful video? Clever how it's done. I'm glad this thread has been bumped. This video seem to have had a resurgence in popularity lately.